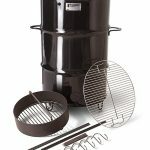 Outdoor electric grills are generally for the person that needs to compromise. You might not be able to have an open flame or might not have the space to accommodate a full sized gas or charcoal grill. 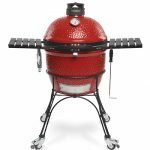 We’ll take a look at the best outdoor electric grills that are on the market today, varying in size, style and price hand chosen by the KotC team. Never run out of fuel – One of the major positives of electric grills is that they use an energy source that is (for arguments sake) infinite. 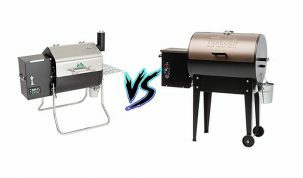 Comparing this to gas or charcoal grills, which both have the possibility to run out at inconvenient moments and you’ve got the most reliable heat source on the market. 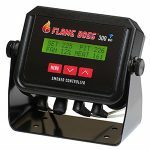 Very safe – As there is no open flame or gas there is less of a risk of injury or malfunction. The electric heating element will still obviously get very hot, but the potential for injury is much less with an electric outdoor grill. Very consistent cooking area – Like with gas grills, electric grills have a very consistent cooking area. This means you get much fewer hot spots compared to coal. A very useful quality for a grill to have if you’re cooking lots of food at once. More likely to be allowed in condos or apartments – Seeing as electric grills require no gas or coal they tend to be looked upon much more positively and are generally accepted in most apartment complexes. 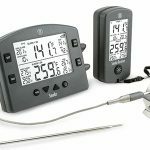 This has even led to many companies designing grills specifically for small balconies and even electric grills that work both indoors and outdoors. Lack of open flame – Whilst it is definitely a positive for some people not to have an open flame, it can also be a deal breaker to many others. If you like the char-grilled taste that an open flame can bring to your food, then an electric grill will leave you disappointed. Not great at searing meat – Electric grills heat their heating element to it’s max temperature, then turn off, then turn back on again when the temperature is dropping, it’s difficult to get the high heat needed for a long period of time. 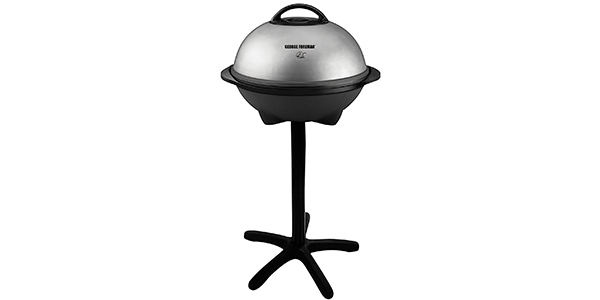 Usually fairly small – Outdoor electric grills tend to be on the small side. In comparison to other grills and even smokers the cooking area will be less than average. This means you’ll often tend to struggle with large cooks for many people. But seeing as these grills are idea for (and sometimes specifically designed for) small balcony grilling, that might not be such a problem. Can be awkward – Seeing as electric grills require a connection to an electrical outlet, you may find yourself with wires and extension leads strewn throughout the house. 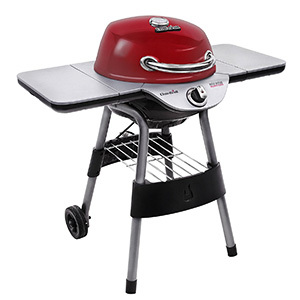 Before you buy one, check that you have the outlets and cables ready for such a grill. 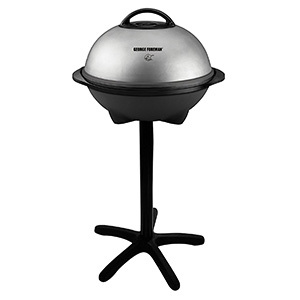 The Geroge Foreman Indoor/Outdoor Electric Grill is a typical George Foreman product. 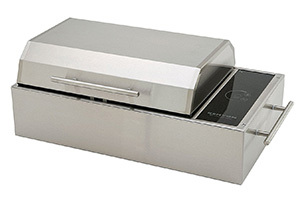 It is relative well made, has a very simple design and makes cooking great, lean food as easy as it can get. 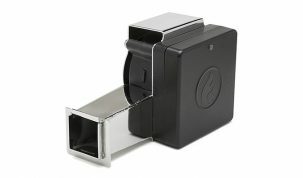 What’s different about this one is that it is designed for outdoor use. It has a removable stand that makes it easy to use anywhere, from your garden, to a balcony or even when you’re tailgating. The actual grill itself has a circular grilling area of 240 square inches which is enough for more than 15 servings. Like all George Foreman Grills, this has a tilt to allow all the fats and oils to be removed. The drain is in the center of the circle which also helps to create multiple cooking areas. The George Tough Nonstick Coating. This is the durable, easy to clean nonstick coating that is used on all George Forman Grills and makes cooking and cleaning of the grill a whole lot easier. A simple, removable stand means that makes transforming the grill from an outdoor grill to a tabletop grill incredibly easy. 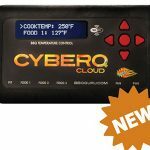 An adjustable temperature control that lets you chose from five different settings to give you more control over your cooking. Overall, the George Foreman Indoor/Outdoor Electric Grill is a simple, affordable grill that does a very respectable job at grilling anything you want. It produces great tasting food and has the added benefit of making whatever you cook that little bit healthier by removing the fats and oils. It’s not perfect, though, as it does take a long time to heat up and never reaches the high temperatures that other grills do. But for this price you’re going to be hard pressed to find a better outdoor electric grill. 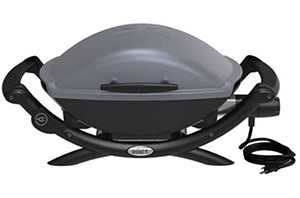 In the mid range outdoor electric grill category the Weber Q 2400 dominates. 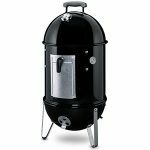 This is an electric version of Weber’s standard Q range and it has all the tell tail signs of Weber’s best. They have managed to make the fairly small grill develop a lot of heat, with a maximum temperature of 600°F (315.5°C), a very quick heat up time and a great recovery time if the lid is lifted. But the trade off is that this electric grill is at the upper end of the mid range price bracket and is considerably more than the similarly sized George Foreman from the last part. 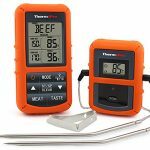 The Weber would be our pick for someone who is looking to take grilling seriously. The George Foreman will make do for the odd cook for one or two people, but the Weber, with it’s quick heat times and high maximum temperature make for a much better prospect when cooking for guests. The Q2400 isn’t recommended as an indoor grill so you will have to keep it outside. Also, it is quite expensive, but you do get a very good grill and definitely get what you pay for. Char-Broil have a growing range of TRU Infrared grills on the market today and their newest one is powered by electricity. 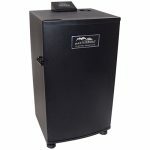 Previously the charcoal TRU Infrared Kettleman made it onto our list of the best charcoal grills under $200. So, we had high hopes for this and it hasn’t disappointed. Using the same Infrared grates as the Kettleman gives the Patio Bistro an expensive feeling cooking style that maintains the moisture in the meat whilst cooking incredibly evenly with reduced flare-ups. This kind of cooking is normally reserved for only the best infrared grills. 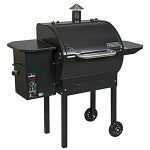 If you’re looking for something a little different that is well made and well priced then the Char-Broil TRU Infrared Electric Grill might be the perfect grill for you. It’s feature packed and offers what a lot of other grill simply don’t. Whilst Infrared cooking is far from a necessity it is something that everyone in the King of the Coals family is beginning to warm to quicker and quicker. The Kenyon B70090 is one of the best made grills we’ve seen. Made from a 304 grade stainless steel it is weather and rust resistant. 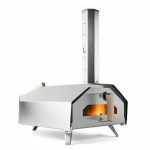 It has a patented concealment of the electric element which helps to eliminate flare-ups and make cooking as simple and consistent as possible. This is also helped by the grates, which are non stick and help to impart the characteristic barbeque grill marks that other electric grills struggle to provide. The Kenyon is also incredibly powerful, it can heat up to 600°F (315.5°C) in less than 10 mins due to there being direct contact between the heating element and the grates. Overall, the Kenyon Frontier Portable Grill is a fantastic product that is incredibly well built and a joy to use. It does have problems though. The main one being the price. You could buy almost 3 Weber Q 2400s for the price of one Kenyon. It also has a relative small cooking area, at only 155 square inches. However, the cooking experience on the Kenyon is the best of the products on the list. It’s also the best made and we think it looks the best. It would be almost perfect as a natural gas grill replacement for your outdoor kitchen with the gorgeous stainless steel finish if it was a little bigger. Luckily if you want one that is a bit bigger Kenyon provide a nice range of large product, just be ready to pay a premium. So, if you’re looking for a very high quality grill that you can use inside just as easily as outside the Kenyon is a very respectably choice. Keep it clean! Most electric grills are very easy to clean after use and keeping them wiped down will ensure you get the best possible taste the next time you use it. If you’re unable to use charcoal or gas grills then don’t worry, electric grills are here to save the day. Despite the huge range we’ve managed to narrow the options down to a few grills that we think deserve your time. The George Foreman Indoor/Outdoor Electric Grill is a great low budget option that can comfortably handle a lot of food at once. The Char-Broil TRU Infrared Electric Grill can introduce you to a slightly different way of cooking and the Kenyon is for those of you who want the best of the best. But overall, we’d recommend the Weber as our best electric grill due to it’s great build quality, consistent and easy cooking and fast heat up times. 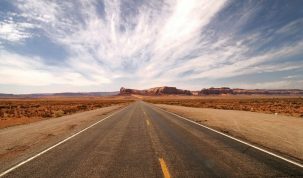 If you have any other questions or would like to know more, then leave a question in the comments or connect with us on our Facebook.